[Jesus said,] "This is the meaning of the parable: The seed is God's word. 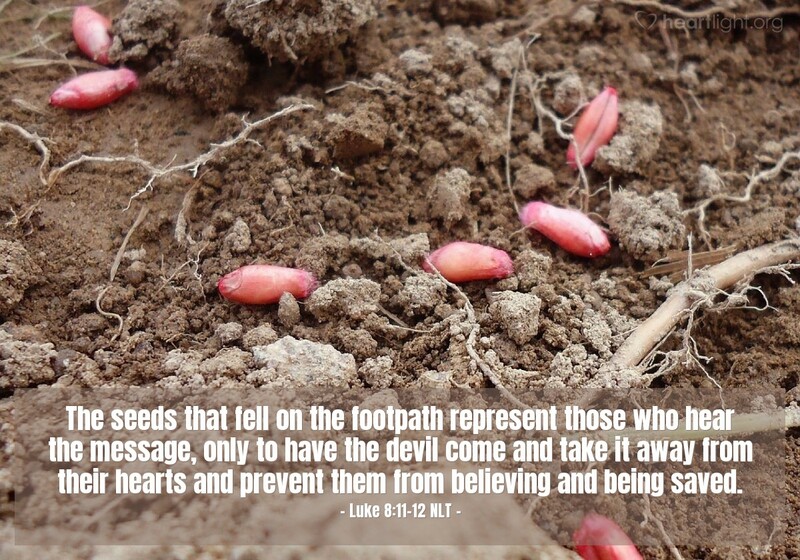 The seeds that fell on the footpath represent those who hear the message, only to have the devil come and take it away from their hearts and prevent them from believing and being saved." As we share the message of Jesus, we need to know that there are all sorts of forces, powers, and people who will seek to destroy, corrupt, and negate that message in the hearts of those who are open to God's Kingdom. Sharing the message of Jesus Christ is far more than sharing our religious opinion; it is spiritual warfare against the evil one and all of his forces. He does not want Jesus' name honored or God's Kingdom to rule in the hearts of men and women. That's why the apostle Paul solicited prayers for his efforts to share the gospel. That's why he was sometimes met with fierce opposition and persecution. More than just the power of closed minded, hard-hearted, and bigoted people, those who share the message of God's grace in Jesus take on the powers of hell. It will sometimes not be easy, but we can always be assured that we will ultimately and eternally be victorious! Father, the one true and holy God, may your will be done on earth as completely as it is in heaven. Please guard me as I seek to live and to share your truth with those around me. Protect your servants who share your good news with others. Please guard the hearts of those who are deciding about the gospel right now. Help them see the radical choice they are facing. Give me great boldness to declare this message clearly and courageously. In Jesus' name. Amen.